I recently obtained a childhood picture of me, dating from the time I was about 1.5 to 2 years old. I do not really know when it was taken, but I know where it was done, just outside of Cleveland. I had never seen this photo before. I do not have many pictures of that period of my life. That is because technology for consumer cameras was note widely dispersed. My family used Polaroids and a crappy Kodak Instamatic. My adoptive parents also were lousy photographers with no storytelling sensibilities. Mainly I think there was so much going in their lives that was sucking their time and energy that capturing “happy times” on film was a waste of time. Half of the pictures from this time of me are in black and white. None are well composed. They exist as an afterthought. There was no clear intent to capture the story of my family or my childhood. They were more holiday and event pictures. They likely were meant to be put in an album and provide a mirror to lives of what a middle-class American life should be like, not what it was actually like. This one picture, however, was different. I am engaging the camera. I am wearing overalls, something that my adoptive parents liked to dress me in, maybe because they were German-Americans. I have an innocence in this picture that I have never seen in other pictures. I actually have a decent haircut. About five years later I would go somewhat feral and wear long, unkempt hair, particularly after my parents divorced and things went amazingly sidewise. I looked a bit like a heavy metal rocker in a tiny body. However in this shot, the hair is tidy. My ears stick out. And you can see my nose is big and will soon grow bigger. I have the physical traits that I carry with me today. However, I became a skinny kid and stayed thin my whole life, when it appears I could have gone a little chubby. The man in whose lap I am sitting on an outdoor lawn chair is my adoptive father’s father. I never knew we were photographed together. 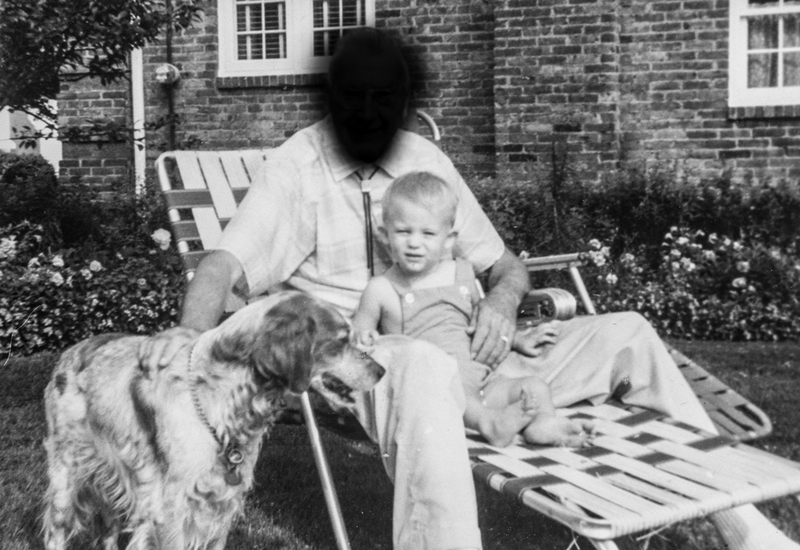 My adoptive grandfather died in my childhood, when I was less than 4, and I have almost no memory of the man. The dog is his Brittany spaniel, who I remember more, actually. This was about three years before things went truly off the tracks for my family, with my father at the center of the storm—the storm itself. I am left to wonder, what did my adoptive grandfather think of this child in her arms. Did he know who his son was, and what he had in store for his adoptive grandson, me, and his adoptive granddaughter. Did he really care about me, someone who was not related to him biologically. I will never know the answers to these questions. All I can do is wonder and think about a moment in time I never knew happened until a few days ago.